What are they? In Middle Earth, wargs are a species of demonic wolves. Wargs are also called Wild Wargs by the people from Rhovanion. They're not an ordinary species of wolf, for wargs are considered allies of the necromancer Sauron and the goblin race called Orcs. It's said that Orcs rode upon the backs of Wild Wargs. Firstly in Tolkien's universe, the wargs are enemies of humans, elves, hobbits and dwarves. When goblins planned to raid a certain village to steal people as slaves, the wargs appeared there also to ambush. Wargs would've killed anyone there and seem like four-legged soldiers of the antagonists. 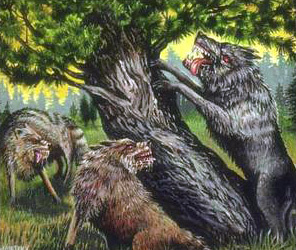 While these wargs from the "Lord of the Rings" saga appear as demonic creatures, the term warg comes from Old Norse that means "wolf". It referred to Fenrir, the giant wolf, and his sons Hati and Skol from Norse myth. In Norse myth we can find out that wolves were mounts of the giantess Hyrrokkin and Volva witch Hyndla. Earlier stories of the Valkyrja rode wolves. It's not clear how these wolves behaved, except that they were very big and had the ability to run so fast across the air and land. In George R. R. Martin's works, a Warg is the name of a person with special magical abilities of entering the mind of an animal. They're also considered skinchangers.